Buffet Enhancements 1BMF36BD Marquis™ Decorative Water Fountain 36"
TigerChef > Browse by Store Type > Catering Supplies > Catering Displays > Fountains >< Decorative Water Fountains > Buffet Enhancements 1BMF36BD Marquis™ Decorative Water Fountain 36"
Set an elegant, eye-catching centerpiece at your reception, banquet, or high-end restaurant with the Buffet Enhancements 1BMF36BD Marquis™ Decorative Water Fountain 36". Designed with precision brass fountain jets, including remote-controlled LED lights, this product provides an incredible cascade of light and water, elevating your food presentation. 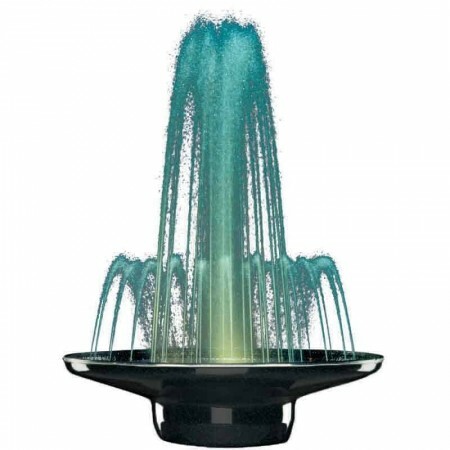 A stylish yet economical solution, this fountain does not require water supply as it holds and recirculates up to 6 gallons of water. Made from exceptionally durable fiberglass with hand-brazed copper rings, this one-piece, portable item is built to last and will withstand heavy-duty use. Thanks to its black diamond Chefstone™ base, this decorative water fountain easily complements any decor. Dimensions: 36" x 11" x 36"